This verse came up again last night. My brother-in-law was teaching the message at my hometown church. This verse has been showing up quite a bit– radio broadcasts, songs, devotions, and totally random places. This morning I’ve been afforded some time to write so it seems a perfect opportunity to focus on this well-known verse from Luke 12. Just over two years ago, I was driving to my corporate job and noticed an unusual site. A patch of white iris’ were growing along the highway. The hillside was right next to my office building but could not be seen from the lot. Road construction closures led me past this site as the quickest route to work. I would actually pass my office to the next available exit. At the time, I was experiencing one of my spiritual growth spurts. The rational of worry puts things in proper perspective– worry won’t help any concern. Worry makes issues larger than they truly are. A few months later, I lost my corporate job. I have written about the aftershocks quite a bit. That loss was one of the best things to happen to me. The reality is, the logic is counter intuitive to modern rational. My biggest concern at that time was personal and business debts we carried from paycheck to paycheck. There would no longer be a regular paycheck. And yet, as I packed up my belongings, the Spirit living in me offered a peace that God had a better plan than my six-year outlook. Even today, the numbers don’t make sense on paper but God always provides enough; more than enough. Tomorrow the date will be August 8… 8/8. For nearly thirty years on this date I’ve recalled a purchase I made at a beauty supply store. A curling iron that cost $8.88. The date was 8/8/88. My check number? Yes, that too had a series of eights. That caught my attention is such a way that I’ve brought it to recollection every year since. One of my traits is attention to detail and it is how He speaks to me. This is true with finances but also with scripture references that connect like threads of life’s tapestry. I’m not the only follower of Christ to speak this language. I have heard many stories to bear witness to His attention to detail. Many will brush things off as coinsidence with a chuckle. But if you give credit where credit is due, these amazing parallels often occur throughout your day. With this assurance, walking by faith does provide a peace beyond all human understanding. That’s the thing I like about faith– the more I rely on it, the more tangible it becomes. It defies logic. I only wish I could truly communicate to logical folks how amazing life guided by the Spirit can be. The problem is, it takes a lot of stripping for a person to finally realize good works are not paid with blessing. It is by God’s grace alone. If a nonbeliever hasn’t yet arrived at the place they have nothing else to hold on to, they will still try to barter works for blessings. Negotiating through prayers. They are tithing efforts and from abundance and looking for a tangible reward from a God that does not negotiate. There are believers of the prosperity gospel. Like Paul, I have learned to be content with less. Before I lost my job, I had a mental roadblock as I worshipped on Sunday morning. I felt a hindrance to raise my arms in praise singing words of complete surrender. The mental image of myself sitting at my desk flashed in my mind. Two years ago, the roadblock was removed. Today, my current employer might walk into my worship place and stand next to me, arms high and fully abandoned. She might call me into her office midweek to pray or remind me she has prayed before a phone conference. For now, my checks are a fraction of what they once were, but it’s okay. God is laying a foundation for the plan He wants us to live out. 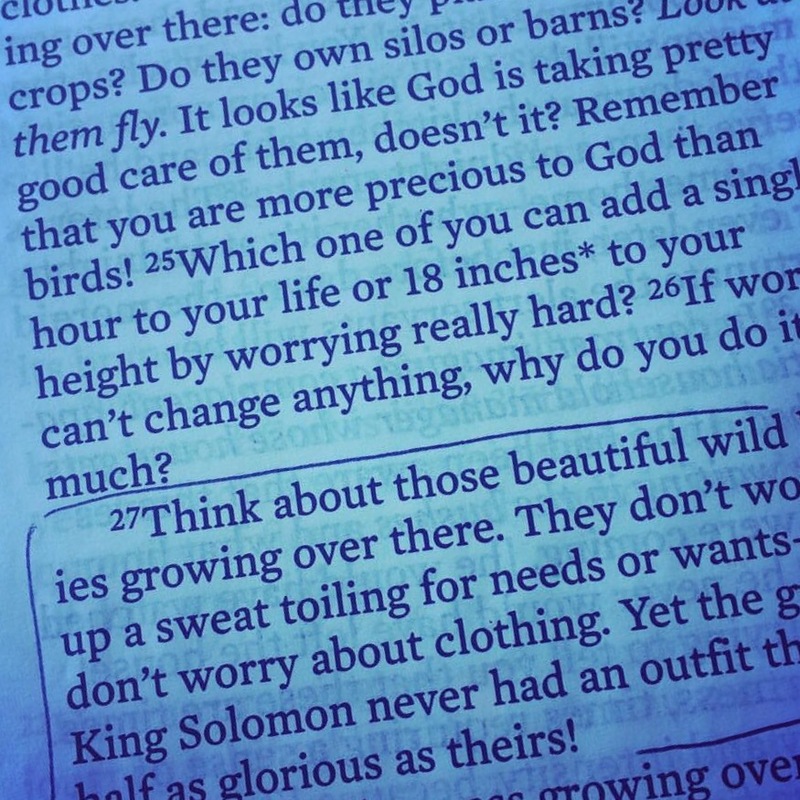 As verse 25 says, will worry add 18 inches to my height? Worry won’t add 18k to my sales quota. Yet I have a peace that surpasses all logic. A solid faith that can move mountains and move me to mountains. Three days after I returned from our first summer camp with Royal Family, the hammer came down. Just three days– I think I had been glowing those three days, having been in the presence of God. I wasn’t sure how to function in corporate culture and the plans were already in motion before I was aware. It isn’t about the places I have traveled to serve. In two years, there is a lot of water that has passed under the bridge. I have much of myself yet to strip away as He progressively sanctifies my life until the day of completion. It’s this peace I cannot describe that I hope to convey. Life doesn’t have to be aligned to standards of this world. In fact, when I see or feel parallels to this world, I know it is time to make a change. I’m not sure who is reading this blog entry but I know I needed to write it. I’m not sure what you have taken from the sentences but please do not interpret our Heavenly Father as a sugar daddy. If you can seek that place of content, you will have manna enough for today. That is all we need. Can you still appreciate His province when you don’t know where your next meal will come from? That is faith. I pass my former office building on my way to my current workplace. The patch of white bearded iris never appeared again. Logically, they should have. Evidentially they were meant for my life-lesson two years ago.